a vending machine Halloween costume. this is our future operators. costume for your little goblin. THE FUTURE OF MOBILE VENDING: http://www.mobilevendingmachines.com/#about CARTS BLANCHE, LLC launches a new sister site to promote our belief that vending is stronger than ever and has the capacity of growing beyond anyone’s expectations with our VendaCarts mobile automated vending trailers. making for a $40 billion a year industry. This opportunity appeals to forward thinking companies and individuals looking for a competitive edge as well as to those entering the automated retail sales business for the first time. Our clients are large companies and entrepreneurs in the industry wanting to expand their business by adding a trailer to their fleet without the need of additional personnel. The Future of Mobile Vending is new to the industry but a concept that is long over due. 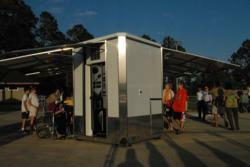 Clients are now expanding into land locked vending arenas that were not available before mobile VendaCarts. VendaCarts makes new locations possible wheeling vending into new location and higher profits. From the Gulf of Mexico to the Arctic and from the Pacific Coast to the Atlantic Carts Blanche meets our clients needs. We provides quality of service that supports clients’ remote operations. Carts Blanche comprehensive solutions cover a wide range of services in a variety of working and living environments. Carts Blanche LLC, is America’s premier “Mobile Automated Kiosk” manufacturer, with an outstanding “Healthy Nutritional Product Delivery System” for the marketplace. VendaMarts is the one and only mobile automated healthy food delivery system in the world. The kiosk design is equipped with up to nine built-in refrigerated/frozen vending machines configured to vend immediate consumables in larger, safe, pre-packaged containers/trays. Remote monitoring systems can be added to the vending machines for easier business management in real time, online. The kiosk system runs on line power and/or generators. Automated machines accept a combination of cash, credit and debit cards for convenient fast transaction. In the past few year’s food trucks, have become very popular in the US throughout major cities with an array of food options. The Mobile Produce Trucks or Mobile Farmers Markets are also popping up with greater prevalence serving the health conscious market of high-end customers as well as low-income residents selling fresh produce. AdvancePierre Foods is the undisputed foodservice market leader in popular fully cooked burgers, Philly-style steak and country-fried steak products. Our center of the plate proteins are made with USDA certified cuts of beef, pork and chicken and other quality ingredients to provide customer-pleasing quality in every bite. Jofemar’s vending machines are the most versatile of the market, it’s Easy-Flex system allows to vend any type of product no matter shape or packaging type, its adjustable system doesn’t require tools to adapt the channels to new products fast and easy, the machines range include models with and without product delivery arms allowing to vend delicate products without hits or falls, there are models equipped with cooling units and all of them include vend detection, there is even a model with a high dimensions product elevator for oversize products. Carts Blanche and Jofemar presents a new concept for the Vending sector, the moving micro-market “VendaCarts”. Carts Blanche, designer of special vehicles, and Jofemar, Vending machines manufacturer, has teamed to create a new concept, the moving micro-market, “VendaCart”, a new system to approach to the main public its favourite products, on an easy manner and with all the options needed. This new formula is specially convenient to be situated on public events and reunions, the design created by Carts Blanche allows for a single person to easily operate the whole system, machines can be installed at both sides of the trailer giving to it maximum visibility, it can be connected to the electric mains or work autonomously with a generator and of course it can be legally driven on any type of road. The machines manufactured by Jofemar http://jofemarvending.wordpress.com/2013/06/18/carts-blanche-and-jofemar-presents-a-new-concept-for-the-vending-sector-the-moving-micro-market-vendacarts/ are the most versatile of the market. Carts Blanche, LLC mobilizes automated sales and opens new market locations for the vending industry. 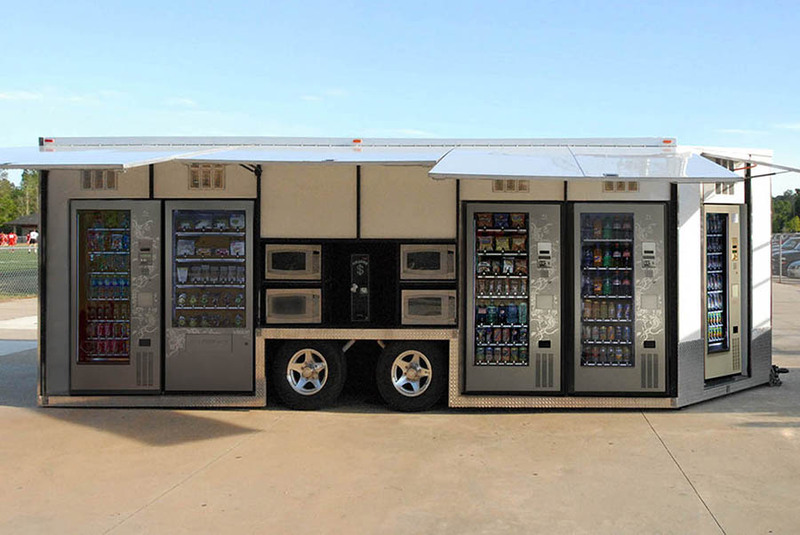 VendaCarts is the first vending trailer designed to take automated retail to the masses. “Carts Blanche, LLC is a socially responsible company that designs vending business opportunities that aren’t reliant on traditional models of vending,” says Annette Nolan CEO of Carts Blanche, LLC. Consider these opportunistic untapped locations: Food Deserts, Disaster Relief Areas, Outdoor Specialty Events, Military Installations, Construction/Building Sites, and Seasonal Attractions. “VendaCarts” offers a comprehensive business design solution without the expense and delays of customization. The integration of mobility and automated machines moves vending from the traditional bricks-and-mortar into an untapped reservoir of customers and sales. These locations provide a wider playing field multiplying locations and profits exponentially. “VendaCarts” trailer design is a mobile automated store that has nine self serve automated machines capable of selling hundreds of products while the self serve automation handles crowds of customers in a much shorter timeframe. “VendaCarts” is sold to the commercial and end-user markets: Vending divisions of companies such as Coca-Cola, Pepsi and Canteen as well as commercial food service providers Aramark and Sodexo, entrepreneurs, military veterans, existing vending companies, concession operators, catering businesses, food service delivery companies, active retirees, persons with disabilities, FEMA and BEP (Business Enterprise Program) for the blind. The National League of Cities www.nlc.org recently published a new report spotlighting the impact of the rapidly changing mobile vending industry on cities, “Food on Wheels: Mobile Vending Goes Mainstream. The report offers best practice for city leaders to take advantage of the benefits of food trucks, while balancing the need to regulate growth and account for the concerns of brick and mortar restaurants. From coast to coast, it is clear that food trucks have arrived and are here to stay. Mobile vending generates approximately $650 million in revenue annually, and is on pace to quadruple revenue over the next five years. This photo was previewed in the report, as impressive as it is I can only think how could this work better? VENDACARTS mobile automated food truck meet the needs of the new food truck generation. VendaCarts is the modern design of this old concept delivering fresh, safe prepackaged products in temperature controlled conditions with self-serve cash free payment system. Vending machines create 4 to 8 self-serve lines and 4 to 8 microwaves for fast and easy customer satisfaction, include an ATM for extra revenue. Vending machines can be stocked and maintained by one person helping keep labor cost down considerably. The National League of Cities is the nations oldest and largest organization devoted to strengthening and promoting cities as centers of opportunities. This expanding trend needs a creative solution from cities to meet this new demand that is here to stay.